All the waiting is finally over! All the products in the fantastic new catalogue (best one yet, I think!) are now available for purchase! The Painters Palette stamp set and the new Layering Squares framelits are just made for each other! 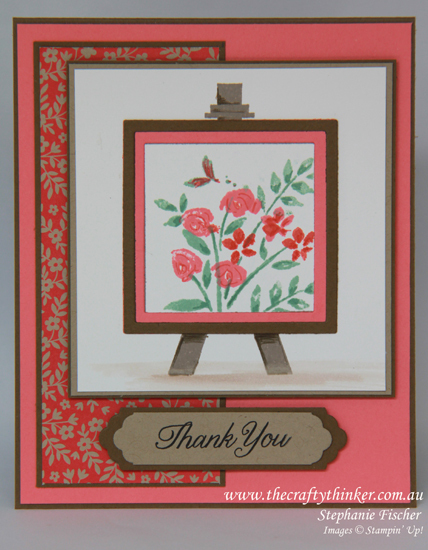 For this card, I stamped the easel from the Painters Palette set with Tip Top Taupe Ink onto Whisper White cardstock. I then added some shadows with a Soft Suede Stampin Write Marker. Masking the square of the frame with some scrap paper, I then stamped the "canvas" area to look like a painting. I used the two step floral spray from the Number of Years stamp set with Mint Macaron, Flirty Flamingo and Watermelon Wonder inks. I then used matching Stampin' Write Markers to add some shading to the leaves and flowers. Love the new Layering Squares framelits! I used the Layering Squares framelits to create a Flirty Flamingo mat that covers the entire frame area and a narrower Soft Suede frame to sit on top. I glued these onto the panel. Using an aqua painter and a touch of Crumb Cake ink, I painted a little bit of shadow under the easel to "ground" it. I cut a piece of Soft Suede cardstock ... wide and trimmed each end (one end at a time) with one of the Lots of Labels framelits using this technique. I then cut a piece of Crumb Cake card stock to ...wide and trimmed to a smaller size in the same way. The greeting is from Gift of Love and is stamped with Basic Black ink. The rest of the card is just layering.